A superb build. Download the 2018 Custom Guitar Design Guide and get started! Build, light weight, neck profile and expansive sounds. The onboard mid-boost won’t be for everyone; likewise, the gloss neck. Paul Waller’s vision is deceptive. Outwardly, we have a lovely lightweight, ash-bodied Telecaster that looks like it’s been around the block more than a few times thanks to the typically semi-translucent White Blonde Journeyman Relic finish that’s lightly cracked and features a few dings but is far from overdone. The neck still has its gloss finish over a deep ’53 soft V shape, the big frets feel like a recent refret, and there’s a lively resonance and snap to our initial play test. It might look old, but it plays really well with a slinky, bend-friendly low action. The chromed parts (neck pickup cover, bridge plate, control plate and domed-top knurled knobs) appear un-aged in contrast to the aged nickel plating of the vintage-style split- post tuners - very vintage correct. And this level of detail is everywhere: even the bone nut looks worn and dirty, and the slight fretboard wear is realistic, just like the aged and well-used-looking (uncompensated) brass saddles. Under the single-ply black pickguard, however, lies the twist: a Clapton mid-boost circuit board routed into its own smuggler’s cavity, which also holds the nine-volt block battery. Unlike the Clapton Strat setup of volume, TBX and mid-boost controls, here the Tele’s volume is a centre-notched double-ganged pot. Above the centre notch, the boost is applied (the Clapton is spec’d at +25dB); below that notch, we have a volume roll-off, while the tone control appears pretty normal. 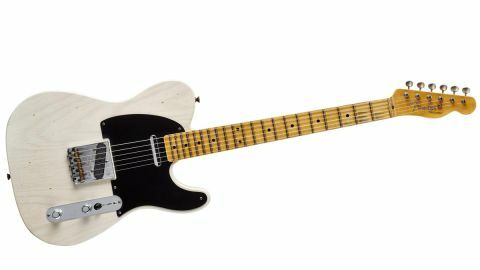 The pickups are spec’d as Hand-Wound Broadcaster (bridge) and ’51 Nocaster (neck) and, as a consequence of the added boost, are underwound with measured DCRs of 4.76k (neck) and 5.15kohms (bridge) - quite a bit lower than you would expect. Sound-wise, the ’53 Tele is ticky to pigeonhole. With the volume in the centre notch position and the tone full up, there’s a stingingly bright voice on the bridge - a little hotter with an active edge compared with our reference original ’69 Tele. Yet the volume isn’t really a volume as you’re used to. Turn down from that centre notch and the sound thins then drops off abruptly. Turn up from that notch and the midrange boost thickens the sound and adds beef (though it doesn’t sound like 25dB). At times, it can almost get too big and fruity, but using this volume/mid-boost and the tone control, there’s huge scope and flexibility that runs from Tele-like steeliness to boosted cocked-wah fatness. To our ears, it’s all about this interaction between these two controls, particularly if you add in a volume pedal. In all this playing and sound experimentation, the guitar disappears, but the neck profile is a hit in our eyes. This Tele is all about its sounds. At £4k this is no impulse buy and that money would bag you an exceptional guitar from many, many makers. Could you do that Friday night gig with a lesser Fender? Of course, but that’s not the point. If you can afford it, we’d wager there are few players who wouldn’t choose a guitar at this level and with the right name on the headstock. The only problem is the colossal choice.